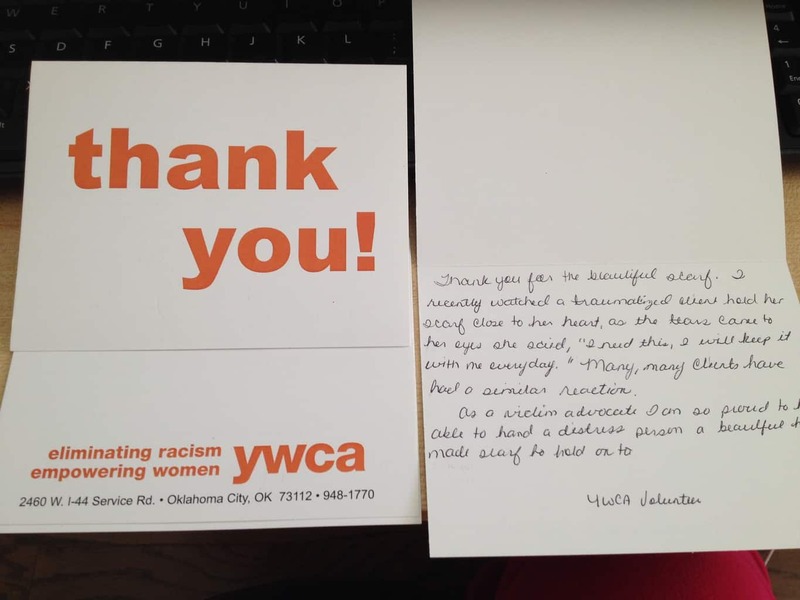 This is the first in a series of thank you notes that we have received from YWCA hospital advocates. The advocates are the volunteers and staff that meet victims at the hospital when they go for an exam. They reach in at an incredibly difficult time and offer comfort to people who have just experienced trauma. Recently they took time to share some words of thanks with us. They wanted to be sure that we know that the scarves we are making and giving are making a difference. Thank you for the beautiful scarf. I recently watched a traumatized client hold her scarf closely to her heart, as the tears came to her eyes she said, “I need this, I will keep it with me everyday.” Many, many clients have had a similar reaction.